Los Angeles yesterday as Clayton Kershaw retired 18-straight hitters during one stretch to lead the Dodgers to a 2-0 win over the Milwaukee Brewers. Kershaw collected 12 strikeouts and walked no one to improve to 3-2 and lower his ERA to 1.73. Kyle Lohse was the hard luck loser again for the Brewers. 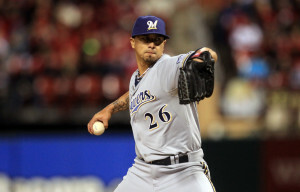 Lohse worked 7 solid innings, but allowed a pair of Carl Crawford solo home runs to suffer the loss. Lohse dropped to 1-2 with a 2.53 ERA in five starts this season. The Brewers dropped 2 of 3 in the series with the Dodgers. They’ll return home to Milwaukee to host the Pittsburgh Pirates at Miller Park tonight.